Go to Bottom of page for examples. Ragdolls are a gentle, laid-back, breed of cat. 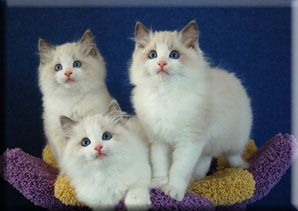 Ragdoll kittens are born pure white with their colors and markings showing as they get older. Their disposition and personality are what makes them truly unique. They are large, affectionate, get along well with other pets, and love being with people. 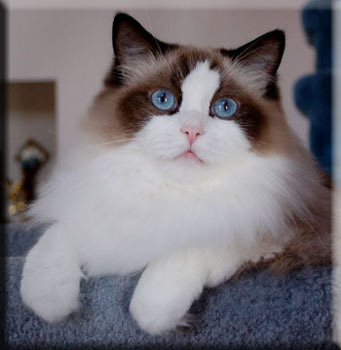 Ragdolls have medium long fur that does not require much grooming and has minimal shedding. Ragdolls are slow to mature taking three to four years to reach full maturity. Adult males range from 12 to 16 pounds with females ranging from 8 to 12 pounds. All Ragdolls are pointed cats meaning that they have color on their ears, face, legs, and tails, with a lighter body color. 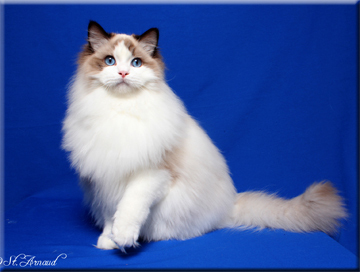 All Ragdolls have blue eyes. Seal Point - Points are a deep seal brown. Body color may vary from fawn to warm brown. Nose leather and paw pads are dark brown. 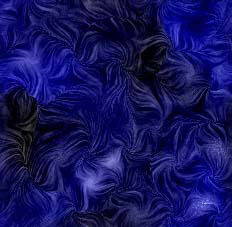 Blue Point - Points are slate blue with a generally gray appearance. Body color is ivory. Nose leather and paw pads are dark blue/gray. Lynx - Striped effect in the markings in one of the previous patterns. White on the inside of the ears. Red, Cream, Tortie - In Reds and Creams points have reddish hue, while the Torties have a mottled appearance in their point markings. Colorpoint - Darker color on face, ears, feet, nose, paw pads and tail. A Colorpoint has no white. 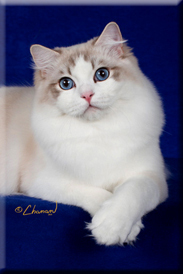 Mitted - Same as a colorpoint only with white mittens on the front feet and white boots on the back legs. They also have a white chin, ruff, and stomach. BiColor - Darker color on their ears, face, and tail. White inverted V in their mask, white legs, feet, ruff, and stomach. Nose and paw pads are pink. NOTE: Copyright © 1999-2019 SuPurr Ragdolls. All rights reserved. This website is the copyright and sole property of SuPurr Ragdolls. It is unlawful to copy this website or any components, including pictures, without the written permission of SuPurr Ragdolls.